Yes, this is happening. Be excited. Or not. Your call. I am not as systematic as some people and therefore probably won't do an exhaustive survey and also probably will at some point decide I'm sick of Beethoven for like, three months at a time. I also don't really have good equipment so take all sound quality stuff with a grain of salt. Since many Beethoven cycles have multiple releases or whatever I will tend to talk about quartets in chronological order rather than in the order of what's on which CD, unless that is interesting for some reason—by the time someone reads this in 2020, a particular cycle might have been reissued with the quartets in a different order. This seems to have already happened with the first cycle I decided to review, the Smetana Quartet (1976-85) on Denon, which was issued on 9 CDs and then reissued on 8 CDs with the quartets rearranged to correspond to publication order. Probably the first thing one notices about the cycle is its sound quality, which is better than any other string quartet recording I've ever heard (excepting the Denon recordings of the Kuijken Quartet, which were probably made by the same people). I won't comment on it further but in all cases throughout this cycle it seems basically perfect. The Smetana Quartet has a very tight ensemble and basically perfect intonation apart from the first violinist, but he is never out of tune enough to annoy the ears of any but the most sensitive perfect-pitch-possessing listener. For this series the Smetana Quartet recorded the rarely heard arrangement by Beethoven of the Piano Sonata in E major, Op. 14 no. 1: Hess 34 (transposed up a semitone to F major). This is a charming piece regardless of what instrument it's played on, with the arrangement being slightly more charming and less terse than the piano original. The quartet approaches it with seriousness and urbanity, so that the charm has depth and never seems kittenish or mannered. I can't imagine a better performance at the moment, but I'll have the opportunity to hear several more, so we'll see how that goes. First to be composed among the numbered quartets, and thus the "beginning" of the cycle, is Op. 18/3 in D major. The Smetanas get off to a weighty start here with an unusually quick first movement—4:51 without repeat—that is fiercer and livelier than the typically relaxed, "pastoral" performances one hears. Agitation and a certain heaviness also prevail in the slow second movement, whose double counterpoint seems like an homage to two other B-flat major slow movements by Haydn (Op. 33/2 and Op. 50/3), and the third movement is fine and unremarkable. The quartet's most original feature is the fleet and featherweight tarantella finale, which in its freedom and delicacy has been compared favourably to Mozart. But the performance here is heavier and more heroic, and slower—5:36 without repeat; compare Vegh '74 @ 5:03, Budapest '52 @ 4:23—turning it into a more solid, traditional finale that somehow ends up feeling less substantial. An interesting if not entirely successful start. Op. 18/2 in G major, sometimes referred to as the "Compliments" Quartet for some odd reason, came next and is in some ways the most Haydnesque of the early quartets—the opening movement calls to mind Haydn's Op. 33/5, the slow movement with its mini-scherzo enclosed inside an adagio is a conceit invented by Haydn and the finale in particular is a distinctly Beethovenian spin on the Haydn rondo finale. The Smetana Quartet's interpretation here is significantly more Mozartian than Haydnesque: no roughness, no sharp edges, all sweetness and light, with a tinge of subtle melancholy. Everything is clean and perfectly timed, and the humour is somewhat underplayed. In particular the second movement, which is one of Beethoven's sillier conceptions, is played very straight and serious with no real sense of fun. Perhaps that was the point; it's hard to tell. Op. 18/4 in C minor, third to be completed, is also one of the two Op. 18 quartets recorded by the Smetanas prior to their complete cycle (on Westminster in this case). I have not heard the earlier recording. This one is light and not particularly dramatic, with the Smetanas proving they do have a sense of humour after all in the Andante scherzoso quasi allegretto second movement—almost parodistic in its overemphasis and attempts at seriousness. The mood overall is congenial and humorous; the heroic "C minor mood" of some of Beethoven's later works was not yet something he had developed at this stage and could still use it for comparatively light and divertimento-like works such as this quartet. The next two quartets, Op. 18/5 in A major and Op. 18/6 in Bb major, did not build much goodwill in me given my doubts about the two previous. 18/5 started as Beethoven's attempt to emulate Mozart's K.464, the penultimate of his six quartets dedicated to Haydn, but in this reading it sounds like a pastiche by a dutiful student with not enough of the humour and grace the Mozart work possesses. The quartet is arguably Beethoven's weakest, but in a good performance it can be more substantial than this. Op. 18/6, "La Malinconia", which Beethoven chose to close the set, is light and gentle and well-mannered without ever really building momentum or memorability. It is a middle-of-the-road performance with few distinctions. The "Malinconia" adagio introduction to the finale is sweet and tender rather than particularly melancholy. The last of the Op. 18s to be completed—it was written immediately after Op. 18/3, but the first movement in particular was extensively revised after Beethoven had completed the remaining four—but published as the first of the set, No. 1 in F major, receives a more substantial performance. It is the most large-scale of the early quartets and certainly the most dramatic. The Smetanas do bring out that drama, but in somewhat of a small-scale way, with the music never feeling particularly unsettled. In particular the famous second movement Adagio affettuoso ed appassionato is more elegiac than dramatic, without the sharp pain that some performers find in it. The scherzo and finale are in high spirits, but the finale for some reason lacks the unstoppable forward momentum of other versions. There does also exist an earlier Smetana Quartet recording of this piece, which is available on a BBC Legends recording and can also be heard on YouTube. This recording—from 1963—is in significantly worse sound quality (mono) and reveals that the quartet had, somehow, an even tighter ensemble, and freer timing. The drama unfolds on a larger scale here, the playing is rougher around the edges, and the missing forward drive is here in spades. So basically the earlier recording is far superior if you don't mind mono and, honestly, probably one of the great versions of Op. 18/1 in general. Five years after the final touches were put on Op. 18/1—and three symphonies, an opera, and four piano concertos later—Op. 59/1 in F major, the first of the quartets dedicated to Count Razumovsky, was a milestone not only in Beethoven's career but in the history of the string quartet itself. No earlier work in the medium by any composer I'm aware of is on a larger scale (and Beethoven himself would not write a larger one until 1825). It's typical for performances of this quartet to have a paradoxical stillness despite its surface drama, a sense of superhuman ease and power; but the Smetana Quartet does not take that route. Their reading here is of the Beethoven of heroic struggle and triumph over adversity. Thus the first movement unfolds as a large-scale drama, the third has an unparalleled depth of feeling and a sense of darkness yielding to light with its transition to the finale. Something is missing in the scherzo perhaps, which is serious and weighty in this recording, played with some bite and roughness but no real sense of the grotesque or capricious. On the other hand, the finale—which sometimes can seem a bit too light for this work—here has some gravitas along with its high spirits and makes a totally convincing conclusion. Op. 59/1 is a qualified success. Op. 59/2 in E minor opens with a highly concentrated movement in which the Smetanas play up the dynamic contrasts for once. It is a brusque and "take-no-prisoners" approach but one that never approaches the slashing modernism of, say, the Hagen Quartett. There is always an earthiness to the playing, for lack of a better word, and also a beautiful tone maintained even through the roughest sforzandi. The adagio is taken at an unusually quick tempo [10:42] that quite possibly originated with the Smetanas themselves and seems to be characteristic of the Czech school—compare Škampa at 11:06, Talich at 10:52. At this speed it is contemplative but not still, with agitation in the dotted rhythms and a sense of extraversion. The lack of inwardness seems to reflect the way Beethoven cleaned up his depression to present it in a more optimistic and assertive way to his brother in the Heiligenstadt Testament but that's probably too fanciful. Still, a sense of ultimate optimism through adversity seems to describe this movement well. The allegretto with its "Russian" theme is quite refined and patrician, and very far removed from the rough humour Beethoven probably intended, but no worse for that. The Smetanas bring their full power to bear on the Presto finale, which builds to a very controlled fever pitch, lively and sane rather than rushed and unhinged; as far as performances of the movement go it is one of the great ones alongside the Hagens. Thanks in part to the superb sound quality we can also hear how the two stabbing final chords are a cancrizans/retrograde of the two stabbing chords that opened the entire quartet, something I actually hadn't considered before hearing this recording. Op. 59/2 is an unqualified success. Op. 59/3 in C major, the last of the Razumovskys, is sometimes considered a problematic work (and also doesn't seem to include a Russian folk theme as the other two did, though some have pointed to the secondary theme in the slow movement being derived from one). After its mysterious opening introduction is a very lively allegro, which the Smetanas take in a not very humorous or contrasty way, although it's still good fun. The second movement's obsessive and circling character, comparable only to the "Serioso" Quartet, is downplayed as well; this recording is somewhat lighter and softer in articulation and dynamics than the usual fare, though maintaining a dark tone colour. The quasi-classical minuet that follows is graceful but with deeper agitation, some irony, no humour; overall impression is melancholy and nostalgic, particularly the transition into the final fugue. The fugue itself is slowish and a bit pompous; the Smetanas seem to be going for weight but it falls flat in my view. So, not exactly a strong finish to the Razumovsky trio. The next two quartets were written two years after completing the Razumovskys, at the height of his international fame in 1810—around the time of the seventh and eighth symphonies and the "Emperor"—apparently simply because Beethoven felt like it. Op. 74 in E-flat, the "Harp", opens with an introduction that builds a pleasant frisson of tension, leading into an allegro which is excellent in the Smetanas' characteristically genteel way but lacking in real vivacity. Their style works very well for this quartet so I was disappointed to find the first movement less than perfect; that said the other three do make up for it. The Adagio ma non troppo, one of Beethoven's most beautiful movements, starts out lyrical and calm but gradually deepens to end in profound melancholy—not quite the anguish of the best recordings, but in this movement where pure sonority is of the highest importance the Smetanas certainly deliver. The scherzo is taken at quite a breakneck pace and is comparatively dramatic, without the wry humour one sometimes hears in them, and the gradual fadeout reminds one of the Fifth Symphony in its portentousness. It is therefore a pure delight to hear the frothy and underplayed performance of the concluding variations, full of sweetness and humour. Definitely one of the highlights of the set once one gets past the opening movement. Its companion quartet Op. 95 in F minor, the "Serioso", is very different in every respect, particularly its elliptical nature and the things left unsaid. The Smetanas perform the first movement quite aristocratically without much power or energy, instead highlighting the tragic aspects of the music, with the sound quality bringing out a cello line in the final bars that one rarely notices. The Allegretto "slow" movement that follows is melancholy without exaggeration, perhaps not weighty enough; the missing weight is brought to bear on the Allegro assai vivace e serioso, where the disruptive nature of Beethoven's elisions throughout the quartet really comes to the fore. Disruptive by the Smetana's standards at least (this cycle is generally quite well-mannered and prioritises beautiful tone). The same continues throughout the rondo finale, with its anguished introduction and a sense of unease maintained through the movement. Perhaps not the same sense of energy as other recordings. Most problematic in this work is the coda, which seems completely unrelated to the rest of the quartet; the Smetanas play it as though it makes sense, which only makes it weirder. I'm going to call this a qualified success. Op. 127 in E-flat, the first of the quartets dedicated to Count Galitzin, was written mainly in 1824, fourteen years after Op. 95. Beethoven had in the meantime undergone his second great artistic crisis and written the Ninth Symphony and Missa Solemnis. Many commentators hear an unruffled calm throughout this quartet, presumably because they were not listening to the Smetana Quartet's recording. The Maestoso opening is genuinely majestic and heroic, and a quasi-heroic cast prevails over the Allegro that follows, although gradually fading to an autumnal calm by the end of the movement. In the Adagio that follows the Smetanas maintain a "transcendent" "late-Beethoven" sound-world throughout, smoothing out the differences between the variations (and actually ignoring Beethoven's indicated tempo changes). This isn't really justified by the theme and first two variations, which are more amiable and focus primarily on sonority, but it works very well indeed for the final variation and coda, which aim for and achieve the sublime. The sense of kinship between this movement and the Benedictus of the Missa Solemnis is quite pronounced here. The Scherzando vivace breaks this transcendent calm with a superb performance of one of Beethoven's most mercurial scherzi, with just the right amount of force from the players. This mood carries over to the Finale, one of the fastest ever at 6:14—compare Végh '74 @ 7:09, Busch @ 6:45, Emerson @ 6:43, Hagen @ 5:52—which is rough, forceful and flighty but with sudden moments of preternatural calm, one of the few performances where the character of the ethereal coda spills over to the rest of the movement. On a first listen I am prepared to call this one of the finest performances of Op. 127 ever recorded. Op. 132 in A minor, which follows, offers an intense and powerful first movement although somewhat lacking in vivacity. The psychologically unsettled quality of the music is certainly brought out, but always tempered with beautiful playing and moderate tempi. The Allegro non tanto second movement, one of Beethoven's weirdest, is here played without any grotesquerie and comes across as almost a pastoral idyll, only occasionally broken by touches of darkness that flit across its still surface. The Heiliger Dankgesang, usually the main event for listeners, is hymn-like and reverent throughout; the contrast between the Lydian adagio sections and the D major "Neue Kraft fühlend" andante that recurs twice is that of the otherworldly against the worldly, but both feel like prayers. The absence of sharp contrast or dynamic extremes is not felt. The brief Alla marcia is quite polite and well-mannered and fails to shock after the adagio; the recitative is more intense and anguished, and leads to a finale that lacks in power and passion, particularly as it approaches its massive climax. Without a sufficiently powerful finale the turn to A major in the coda seems as much of a non sequitur as in Op. 95, but it doesn't need to be that way, so the lack of coherence here is a genuine issue. Op. 132 is therefore pretty mixed. Last of the three Galitzin quartets is Op. 130 in B-flat, presented here with the Grosse Fuge as finale and the alternative finale afterwards. The most radically dissociated piece ever written by Beethoven, Op. 130 opens with what initially seems to be an introduction, which the Smetanas play with perfect timing and phrasing, and ends up being part of a sonata-form movement in two alternating tempi. The Allegro sections are not so lively here and instead have a sense of mystery and solemnity which works very well, although the development section in particular could be more hushed. The tiny Presto scherzo is rather doleful instead of playful, with its craziness downplayed, and the Andante con moto ma non troppo—Beethoven's masterpiece of sociable nostalgia—is played without either much humour or much nostalgia. (Notable for the underplaying is one key moment when the music slows to a halt after a cadential trill, and in silence the first violin takes up a long ascending scale non troppo presto; the halt here is too short, the scale too fast.) The nostalgia and sweetness are held back for the following Alla danza tedesca, helped by a slower than usual tempo. The Cavatina, which Beethoven reportedly could not think about without being moved to tears, is impassioned and quasi-operatic in style, without quite plumbing the depths of emotion that Beethoven imagined. The alternate finale (not written until 1826, Beethoven's last composition) works quite well here, probably better than the fugue; it prolongs the combined dissociation and amiability of the previous five movements and takes them right to the edge of incoherence without ever quite resolving them, and on numerous occasions whilst listening I thought that if the fugue had never existed this in itself would be considered one of Beethoven's most radical movements. The Grosse Fuge in itself is somewhat of a mixed bag; a swift tempo prevails in the opening Allegro with some bite to the tone, followed by a mostly well-mannered Meno mosso e moderato and a slightly flabby Allegro molto e con brio that starts to pick up and gather momentum once the fugue resumes, eventually building a sense of inevitability and power. Points docked for ritardando into the final chord. Op. 130/133 is also mixed, but more good than bad. Beethoven's penultimate and most famous quartet, Op. 131 in C-sharp minor, is given a weaker performance than I expected, apart from a superb opening fugue with more intensity and less vibrato than most of the other performances in the cycle. The following tiny Allegro is more substantial and weighty than usual, no premonition of the Mendelssohn fairy scherzo here. A nice transition leads into the variations, which in this reading have more nostalgia than whimsy; the performance is a little bit drier than usual and somewhat lacking in humour. The following Presto is taken unaccountably slowly at 6:12—compare Busch @ 5:11, Brooklyn Rider @ 5:09, Hagen @ 5:32, Emerson @ 4:33—and ends up being quite dull compared to performances at a more "normal" tempo. The sixth movement, essentially a mini-Cavatina, is somewhat perfunctory, and the Finale is on the light side without ever really achieving much depth. So ultimately the last three movements sink it for me. With Op. 131 one can't pick and choose since all the movements are continuous. Finally there is Op. 135 in F, the last of Beethoven's compositions (apart from the alternate finale to Op. 130), sometimes seen as a Haydnesque throwback but in reality one of Beethoven's most sophisticated creations. The first movement is very well performed here with an ideal mixture of grace and weirdness. The scherzo is quite slow at 3:47, comparable to the Mosaïques and Eroica Quartets, and lacks both the energy and the sense of timing essential to make it work; in particular the trio comes across as someone telling a joke but waiting too long to give away the punch line. It's a damp squib. Luckily the Lento assai is much better, calm and ultimately elegiac—somewhat like a eulogy in fact, rhetorical but subdued and in an atmosphere of deep stillness. The finale, sometimes considered outrageously comedic by Beethovenian standards, is played quite seriously here, but that actually turns out quite well with the "Muß es sein?" introduction full of agitation and the following "Es muß sein!" Allegro presenting a convincing path to an "earned" happy ending despite tribulations. It's quite possible the Smetanas meant to play this movement with more humour and it simply didn't come through, but overall, Op. 135 is a qualified success. 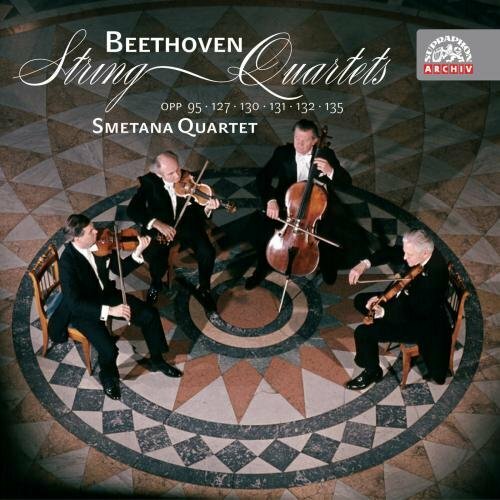 The last six quartets were recorded as part of the Smetana Quartet's more famous Beethoven recording, now available on Supraphon. I haven't listened to it yet but plan to. Quite honestly, although I enjoyed a good number of the quartets, it took a bit of sitzfleisch to get through the cycle simply because of the persistent sense of a lack of energy. That said, Op. 59/1 and 2, 74 and 127 are definitely among the best versions of those works that I've heard and the worst sin committed against any of the other quartets by the Smetanas is making them unmemorably middle-of-the-road. (Ok, except the slow scherzo in Op. 131, that was weird.) I will take a little break and probably do another cycle before I come back to the Smetanas since as much as I appreciated the quality of their playing, the sound of the ensemble never seemed to appeal to me; a lot of surface beauty and not much physicality I guess. Overall, maybe a justly neglected cycle, but worth hearing. I don't really know yet where I will grade it. ...and also probably will at some point decide I'm sick of Beethoven for like, three months at a time. Anyway, excellent write up. More please. Very nice recap, thanks for that. I hadn't heard this set, so it is all new to me. But it does make me want to pull out one of my own sets and waltz (not run!) through it just to refresh how good these all are. Great idea for a thread and your first instalment was very detailed and interesting - thank you very much!. While I have not heard any of their Denon Beethoven in cases (Mozart, probably Dvorak) where I could compare ca. early 60s Smetana Q with their mid-70s-80s recordings the earlier ones were usually less relaxed and more intense. Somewhat like your comparison of the early live op.18/1 with the late one. So the earlier Supraphon recording of the late quartets + op.95 are certainly worth investigating. There is another early 60s studio recording of (I think) op.18/4 and op.59/3 for which the same might be true but I do not know about availability and have not heard them (as these two are among my least favorite Beethoven quartets, I am not going to any lengths to get a chance to). I think these last two are from a partial? Beethoven cycle divided between the most prominent Czech quartets of the early 60s, e.g. in op.59 the Vlach (not the new one on Naxos) did #1, the Janacek #2 (probably the recording that ended up in the Universal Original Masters box) and the Smetana #3. At long last, Todd has got some stiff competition in the art of writing Beethoven reviews. Keep the thread going, missus! I've had the Middle Quartets from this cycle for ages. A good excuse to try the highlights you mention. I also have the Supraphon Late Quartets set. That has a beautiful Op. 132. I'll have to check the timings on the Op. 131. In general, the interpretive differences between this series and the quartets in the complete cycle are not very significant. A beautiful rich tone prevails, although the sound quality is not as amazing, and there is not much drive or humour compared to many modern recordings. Their vision is fundamentally of a sane and sensible Beethoven with not much room for anguish, gaiety, wildness or terror, but always favouring reverence and positivity. That said, the many small individual differences add up—and in some cases are the differences between a performance that doesn't come off and one that does, or between a good performance and a sublime one. The Supraphon recordings are in general tighter, less relaxed, and less broad in scale than the Denon ones. With Op. 130/133 my first quibble with the Supraphon recording is the lack of exposition repeat. It's actually not such a downside here: for once the Smetana Quartet is willing to take steps beyond their sane and neatly ordered view of Beethoven and present this first movement without trying to apologise for its dissociated and formally conflicted nature. It's kind of a step up from the Denon, but a sense of spirituality is lost and the playing is less hushed, so, fairly even. The Presto is mostly fun, not as doleful as in the Denon, and the Andante is not so much fun—more well-behaved. The moments of weirdness are not put into relief and somewhat underplayed. The Alla danza tedesca is almost identical to the later recording, down to the timings; this version has somewhat less nostalgia and somewhat more rhythmic freedom. The first big difference from the Denon is the Cavatina, which is very hushed and played with an almost flat affect, more like a lament than a love song. The Smetanas pull off some extremely soft playing here at the passage Beethoven marked beklemmt, where the music nearly disappears. Only right after this section and then at the very end of the movement do we get any hints of passion. With the Grosse Fuge and alternative finale we are back on the territory of the Denon recording; the GF has more energy and drive, and the alternative finale sounds less revolutionary and powerful and more Haydnesque than in the later version. Edge: Close to 50/50, but I do favour Supraphon slightly. 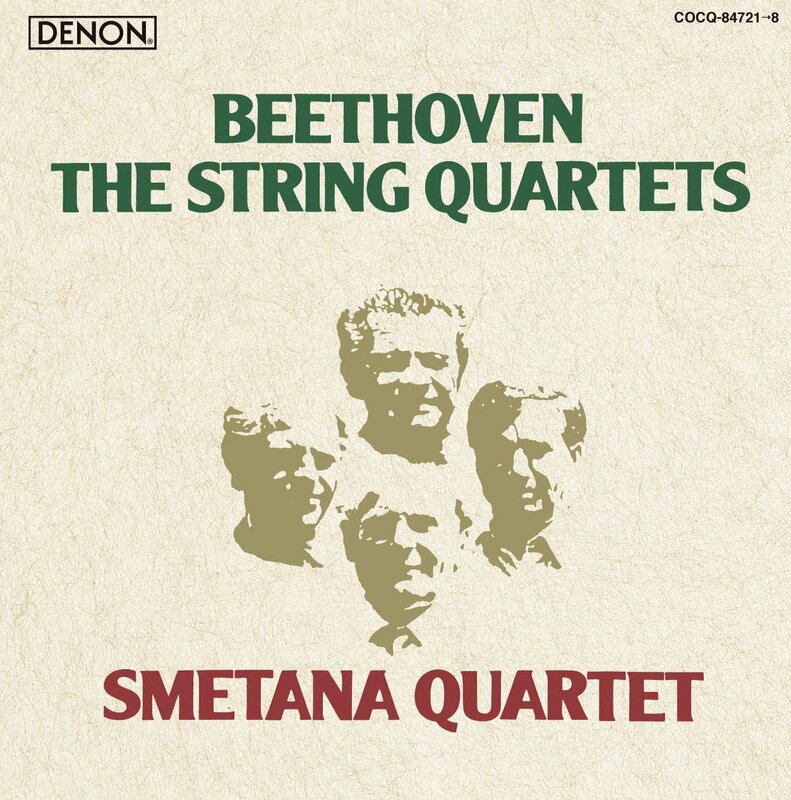 If you are planning to collect the Smetana Quartet recordings of Beethoven this set can supplant any volumes of the Denon set you can't find, apart from the Denon recording of Op. 127, which remains a highlight. I wouldn't call any of the recordings in this earlier set favourites of mine, but they are never less than excellent and there's nothing that truly falls flat. A fine post indeed. Thank you for the update. First of all, a note on transfers. I have the United Archives Budapest 1951-2 set, which comes in a plain red box. The image above is the forthcoming new release from Sony Classical itself. Many people claim the United Archives set is a perfectly good and listenable transfer, and maybe it is if you have good equipment, but for me on my £10 JVC speakers it was airless, compressed, shrill, and sounded like it had been recorded from two rooms over. I'm assuming that the new release will be the one to have, but if it turns out to be even worse you should probably just get the vinyl. 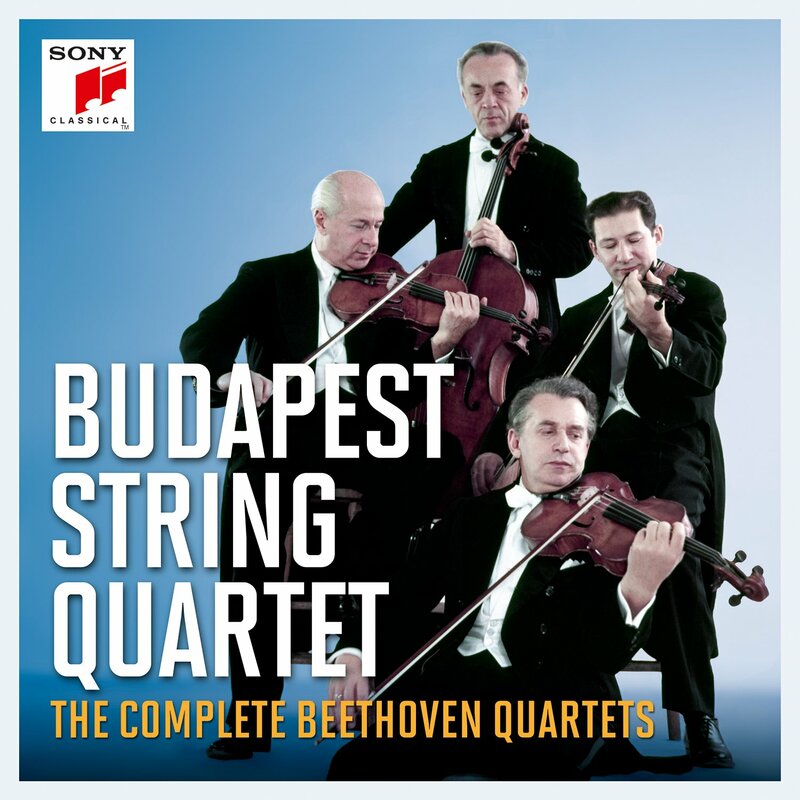 Second of all: the Budapest Quartet recorded almost all of the Beethoven quartets in the 1930s and 40s (I think only Op. 18/5 is missing). These recordings are out of print and I'm still looking for them. The recordings from 1951-2 are their first complete studio cycle, recorded in mono in the Library of Congress, originally released on Columbia. The recordings from 1958-61 are their second studio cycle, recorded in stereo, also by Columbia, to replace the mono set. Obviously, it did not replace the mono set (which has long been preferred) and Columbia went out of business. Maybe wouldn't have happened if they kept all their older mono recordings in print. Let this be a lesson for us all. There also exists a live cycle, recorded between 1940 and 1962 at concerts at the Library of Congress, released on Bridge Records. I have listened to it. Particularly in the earlier recordings, the intonation and ensemble are more secure than either studio cycle, which is what makes me curious about the 1930s and 40s recordings. The sound is quite bad, and often seems artificially compressed/denoised. In general there is not much you are missing if you have the two studio cycles—the live performances are often faster, with somewhat better intonation, and more dynamic than the studio recordings, but the sound quality can make it hard to tell. I would not consider it worth a special purchase unless you're a completist or in love with the sound of the Budapest Quartet, but there are some special things in it: the Op. 59/1, recorded in 1941, and Op. 132, recorded in 1945, are superlative. The Op. 74 (also from 1941) is fascinating as a portrait of a quartet style that probably couldn't be revived today, although the Alexander & Elias Quartets are trying. The Op. 95 (from 1940) is unique: gnomic, disruptive, highly variable in tempo, and unfortunately captured in extremely fuzzy sound. The Hagen Quartett's recording is a similar approach. Anyway, on to the studio cycles. The mono Op. 18/3 inaugurates Beethoven's cycle in a general mood of lively innocence. There may be more to the D major quartet than sunny pleasantries—in fact it is nowhere near as open-hearted and ebullient as Op. 18/2 or 18/5, and has deep undercurrents of fantasy and wistfulness—but this performance deemphasises those aspects, incorporating some drama but for the most part relaxed and lively. The finale is powerfully rhythmic and played about as quickly as it can reasonably be taken. Overall it's a very good 18/3, perhaps not an absolute favourite but very promising. The stereo 18/3, to my surprise, was an improvement in every respect all of the same virtues, stereo sound, and more tenderness and beauty in the slow movement. The main complaint with the stereo set is that it's too relaxed and unfocused by comparison with the mono set, but here the extra degree of relaxation seems a benefit. Op. 18/1 is a similar story for me. The work plays to the Budapest's strengths, which is fiery, no-holds-barred playing without worrying too much about the niceties of being in tune or making a nice sound from one's instrument. The adagio, highly dramatic to the point of being operatic in character, is as fine a performance as I've ever heard; the quick movements are played with drive (maybe sometimes to excess). One thing that did bother me was that the Budapests use what seems an excessive amount of vibrato, although obviously typical for the period. The stereo version is leaner and edgier, with better intonation and less vibrato, but for the most part more of the same and works very well indeed. The mono recording would have previously been my favourite recording of Op. 18/1; the stereo recording surpasses it. May have to do a comparison with the Smetana Quartet on BBC Legends, who obviously have even better intonation and a much more blended group sound. In the mono Op. 18/2 the humour becomes something like slapstick, particularly in the first movement and in the central allegro of the slow movement. The adagio itself is played with deep feeling; no wink & nudge here with its somewhat overwrought fiorituras, but something more akin to Socrates about to be interrupted by Alcibiades. Although there are moments of tenderness in the scherzo and finale, they are mostly in high spirits, played fast and with typically sharp articulation. The remake is even edgier, less humorous, and the adagio is slightly less good: less feeling, but without gaining much. The finale gains more, ending up a totally convincing triumph. I am still marginally inclined to prefer the mono recording. Op. 18/5 also fares better in the mono recording, which is small in scale and somewhat Mozartian, but with a sense of expansiveness in the variations and some quite subtle playing that reveals more depth than the Budapests' usual fast and furious style. If only the intonation were better. In the stereo Op. 18/5, the intonation is slightly better, but the variations played with less abandon and more hesitancy, and the finale somewhat less frothy and more edgy. Op. 18/6 in the mono recording is clean and sensitive, intonationally better than average for this group, though still not up to modern standards. The highlight is the adagio, a movement that sometimes feels overlooked or treated as pedestrian in other performances. In the "La Malinconia" finale the Budapests bind the two sections together through reduced contrast and moderate speeds. The remake again surpasses the mono recording in every respect except intonation (many more lapses) but the greater hesitancy of the adagio here 7:41 vs 6:55 only benefits. The "La Malinconia" allegretto is suffused with nostalgia rather than the typical edginess, although the overall effect of the movement is tenderness rather than melancholy. Op. 18/4 in both recordings is serious and dynamic, a mini "C minor mood" that downplays the music's humour and strong relationship to the traditions of comic opera. There is not much to choose from between the two; the stereo recording has a more powerful first movement, a more nostalgic scherzo, and a somewhat less interesting finale. With Op. 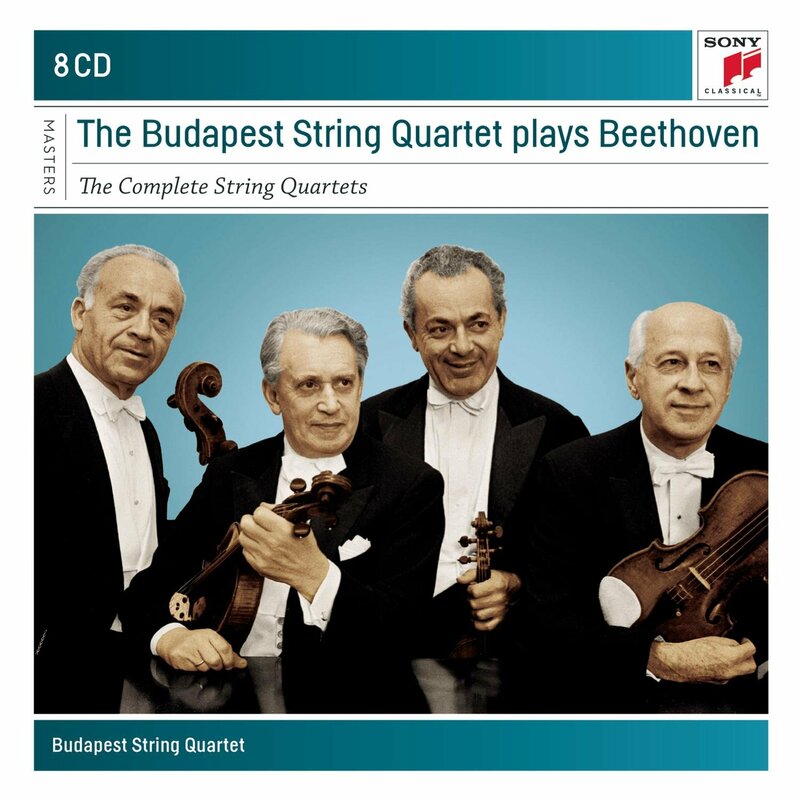 59/1 a good performance needs a strong architectural sense—this quartet is Beethoven's longest before 1825—which the Budapests definitely have. The violin playing in the mono version in particular, however, is painful. This is the work where Beethoven's explorations of extreme registers first became pronounced, coinciding with his loss of hearing in those same extreme registers and almost as though to compensate for it. Good intonation is necessary. The Budapests also play with a lot of vibrato, which is not always to my taste. The allegretto is somewhat dutiful, but with no disasters to speak of; the adagio is bleak and melodramatic, like the accompaniment to an old silent film, but often emphasising the very stark two-part writing; and the finale is wonderfully played in terms of rhythm and phrasing—very fast at 6:05 without repeat, but never seeming too much so. The stereo version is somewhat more spacious, less bleak, and more dramatic; unfortunately the most notable aspect of the performance is the opening cello solo of the allegretto, which is almost a quarter note out of tune. I wouldn't pick either one. (Get the Bridge recording.) In both performances there is a strong sense of the second violinist leading the ensemble. I think it's not unfair to say that Alexander Schneider was by far the best musician in the Budapest Quartet. Op. 59/2 is the first quartet with significant interpretive differences between the mono and stereo recordings. Both versions have no repeats in the first movement, which is generally firm and dramatic (though with slightly deeper feeling in the remake). The adagio is notably different: in the mono version it's not very transcendent, instead agitated and earthbound, though still on the slow end (12:27). The stereo version is more sentimental, with more vibrato, but more convincing in its depth of feeling, and significantly slower (13:59). The allegretto is overdramatised in both versions with not enough genuine soft playing, if slightly better in the mono version. The mono finale doesn't come off at all despite a great deal of suppleness in the tempo; it feels de-energised and lacking a sense of inner conflict. The stereo finale is much better, and faster for once. The tonal conflict that animates the movement is expanded into a psychological one. The two versions of Op. 59/3 by contrast are almost identical: expectant but not mysterious introduction and a lively and stylish first movement, with a second movement that misses the darker aspects and a slow finale. Perhaps the stereo version achieves more depth, especially in the andante, but it's hard to choose between them. The mono Op. 74 is still informed by the old-fashioned aesthetic of the 1941 Bridge recording but with a more heterogeneous ensemble sound and somewhat less vibrato. In interpretive style it feels "transitional" rather than settled, which is rare for this quartet. The first movement is powerful and virtuosic, with little tenderness; the adagio is beautiful, although sounding more like four soloists than a quartet, and avoiding the darker aspects of the music. The scherzo and finale are generally high quality froth. The stereo recording feels noticeably different: more tenderness and humour in the first movement, less virtuosity; a more unsettled adagio; a finale that is maybe slightly overplayed but not really like anything else either: elliptical and somewhat mysterious. The scherzo is busy but not much more; froth has been cleansed from this performance. I prefer the later one slightly, although would probably take the Bridge recording over both of them. Op. 95 combines Beethoven's thin and stark scoring with the Budapest's typically thin and harsh sound to unfortunate effect. In the mono recording, there's somewhat of a tendency towards not enough contrast where contrast would seem to be needed, and too much contrast where continuity would seem to be needed, but that is obviously listener bias speaking. Softer and more lyrical passages in the first movement are played "straight" rather than emphasising the contrast with the more violent and disruptive F minor music. The second movement also starts out played "straight" (with notable intonation issues) and then leads into a fugato that cloys oppressively, with much vibrato, leading to an overall impression of weight and suffocation that works fairly well. The Budapests take "serioso" in the scherzo to mean slowish and heavy—4:50 vs Emersons 4:03 but Chiaroscuro 5:00—with rhetorical hesitations on each sforzando. In the finale the introduction is very slow but not as hushed as usual, and the allegretto is fastish but seems to relax too much at any dynamic level below mf. The coda effectively comes out of nowhere. In the stereo recording, the focus is more on continuity: the first movement is dramatic with the moments of lyricism very attenuated; the allegretto is similar to the mono recording but less effective, as they seem to be trying too hard to wring anguish out of the music; the scherzo is more conventional and less precise; the finale features better highlighting of individual voices and no loss of energy. It's a more stereotypical recording of Op. 95 in many respects, but not bad for that. The late quartets manage to be a notable qualitative improvement from the middle ones, apart from the usual intonation problems. These are particularly notable in the first movement of the mono Op. 127, to the extent that I feared for my sanity, but matters did improve slightly or I simply became less discerning over time. The mono Op. 127 itself is not very notable: a bit overdramatic in the first movement, a mostly-OK adagio, and a good scherzo and finale that don't display any particular individuality but are quite solid. A notable quirk is the first variation of the adagio, played in an ultra-mannered style sounding like an exaggeration of HIP dynamic swells. The stereo Op. 127 is an improvement in that the intonation is generally better, the first movement is less harsh and the finale more convincingly evokes high spirits, but otherwise it's quite similar—although the first variation of the adagio is not quite so exaggerated. The mono Op. 132 on the other hand is where things definitely pick up: this is an A+ recording although with two grades docked for intonation. In the late quartets the Budapest generally avoids demonstrative expressions of sublimity, instead placing the music within the serenade tradition, and that is notable in the first movement of the A minor Quartet which is typically played in a much heavier, more despair-filled manner. It is instead generally light and with some excellent teneramente playing, fleeting and uncertain, though with a forceful conclusion. The Allegro ma non tanto is played almost like a standard sonata form movement, with contrasted first and second themes and so on, though obviously parodic; the trio is played with perfect timing although bad intonation. The Heiliger Dankgesang is very good, one of the highlights of the set, with a sense of losing rather than gaining new strength as it goes on (which is a valid interpretation as well in my view). The Alla marcia is somewhat genteel and well-mannered, but with a sufficiently melodramatic transition into the finale, and the finale itself is appassionato almost to a fault, with a powerful and convincing climax and effective transition to the coda. The stereo recording has many of the same features but generally amps up the ugliness and brutality of the playing, whilst slightly improving on the intonation. The added strength and harshness are noticeable in the second and third movements, but results in the finale seeming somehow less intense. With Op. 130/133 the Budapest pursues an approach that could be described as serenade-like, in general without a huge amount of depth but with plenty of charm, energy and lightness. The mono version is played with the Grosse Fuge and the stereo version with the alternative finale (the missing movement being appended as an extra track afterwards). In the mono recording the first four movements are all excellent, apart from the high notes, and although the Andante con moto could be somewhat more scherzoso—the movement is played with impeccable style and taste, almost more J.C. Bach than Beethoven. The Cavatina starts out traditionally sentimental but gradually becomes more hushed and elegiac (and then returns to the initial sentimentality at the end, unfortunately). The Grosse Fuge is a bit slow—anyone used to the rhythmic precision of modern recordings will be disappointed—but has compelling drive and a very good coda. The stereo recording, interpretively recast to fit the alternative finale, has a slightly slower and more inward first movement, and a notably less hushed Cavatina; more of a love song than an "Edwardian gentleman sobbing into his sleeve" (to quote mandryka). This is noticeable in the beklemmt playing which seems (performatively) intimate rather than oppressed. The alternative finale is played with energy and nascent radicalism, like Haydn but fiercer, and outclasses the mono recording of the same movement in most respects. The stereo Grosse Fuge is less forceful but with some quite physical playing, mostly from Alexander Schneider, and slower across the board; but still good enough that I can safely say I prefer the stereo Op. 130/133 significantly. Op. 131 is similarly light and anti-sublime, comparable to (e.g.) the recent Mosaïques recording in that respect. The mono recording generally avoids weight and forcefulness, with a somewhat undramatic fugue, and the variations played straighter than usual and with a very unusual degree of tonal beauty given the Budapest's usual tendencies. The finale has a kind of tragic nobility rather than force, and is played with a sense of inevitable closure, so the accel into the final chords (usually a more open-ended gesture) seems curiously out of place. The stereo recording generally has a bit more intensity—notably in the scherzo, which is somewhat more fun with more pointed sul ponticello playing—without abandoning the core serenade concept: the fugue is still light, the variations are played with a little more enthusiasm and a lot more vibrato, and the finale at least attempts force although ends up just sounding heavy. (The accel is missing this time.) Both recordings have their good points although I wouldn't rate either one among the great Op. 131s. Beethoven's final quartet seems like a work that should play to the Budapest's strengths, but the mono recording is strangely bland. The first movement is tasteful almost to the point of ossification, not the usual high strung Budapest thing, and the scherzo is swift and dramatic but underplayed, particularly in the craziness department. The slow movement is not exactly calm to begin with, but builds a fair amount of passion and is probably the best thing in the recording. The finale, played straight, has some of the same issues as the first movement. The stereo recording presents a much less bland take, mostly due to the grotesquerie and humour being ramped up, with more extreme sforzandos and pointed staccato playing. And the slow movement is even better, calmer and eventually dying away in exhaustion. The finale is profoundly silly, as it should be. This is a high quality Op. 135. I've had this sitting in my notes for a couple of months now but never had the energy or time to write it up, due to mental health and a series of unrelated life circumstances. I hope this is at least readable. I have not revisited any of the Budapest recordings since December and don't really plan to in the future, so that probably gives some idea of what "tier" these two sets will end up in—whichever tier belongs to the recordings that have exceptional moments but are let down by defects in playing or boring interpretations, below the tier of recordings that are consistently good but not top contenders and above the tier of recordings that are consistently boring or terrible. The defects in this case are intonation, which I've alluded to constantly—they simply do not play in tune—as well as some quite forgettable interpretations (was Op. 59/3 even in either set??? hard to remember). And the sound quality is basically historical. That said, there are good performances in them: I would single out as special both recordings of Op. 18/1, 18/5 and 18/6; the mono Op. 132, and the stereo Op. 130/133 and 135. All were worth hearing and will probably be revisited. The Budapest 1930s and 1940s are different partial cycles. The 1940s appeared on two "Columbia Masterworks Heritage" twofers and also in some more recent big box. op.18/1,4,6; op.59/3, op.29, op.95 and opp.127,131,132,135. The sound is surprisingly good, sounds more like ca. 1950 than 1940-46. From what I have gleaned from reviews, these recordings are generally better in intonation than the later ones. Despite the tempi not appearing too fast to modern ears the straight, lean and rather fast style shows why they were sometimes compared to Toscanini. Of the earlier ones (I think there are a few more/different ones before some personnel changes, not sure about their availability) there were two Biddulph CDs and they are now available as downloads: opp.59/2 und 130 (no 133) and opp.18/2+3, 74. Not sure if there was no pre-war op.59/1 or if this is just really hard to find on disk. There is just one recording of Beethoven by the Budapest which stuck in my mind as really special, that was an op 135 from a library of congress concert on Bridge, in fact I'm listening to it now, it's on Spotify, and it's good like I remembered. This isn't an easy quartet for me, there are only been a few recordings I like - this and Hagen. I am not sure but I think they were not all issued by the same label back then. And it is more than 10 years and personnel changes between the first and last recordings. But you are right that there are no duplications although I think if one considers even older stuff from the 20s there might be. I also think there IS a pre-war or wartime op.59/1 somewhere but I don't know for sure. It's been a while that I listened to them but although I was impressed by the rather good sound of the 40s recordings they are very straightforward and do not feel as "window to the past" as e.g. some of the Busch recordings do and so can be somewhat disappointing on an emotional level. But overall I am not sufficiently familiar with historic string (quartet) playing and also not sufficiently astute a listener to get all these subtle differences. I got a bunch of Biddulph CDs cheaply several years ago, so I have the Beethoven as well (also late Schubert, Brahms and a Mozart disk) but I am even less familiar with these recordings than with the 1940s. In any case I decided that this was enough Budapest Beethoven for me and skipped the more recent recordings. Especially the LoC live recordings seem to have avid fans although they seem also be the ones with the largest differences in sound and playing quality. My notes have no specific comments on that one except "Op.135 ok, no craziness, sound above avg". I will revisit though. A magnificent undertaking! Carry on.